The Discordian Calendar (or Erisian Calendar) is an alternative calendar used by some adherents of Discordianism. It is specified on page 34 of the Principia Discordia. I created a Discordian Date plugin for WordPress which will display the current date according to the Discordian Calendar. Install automatically from the Plugins page of your WordPress administration panel; search for ‘discordian’ under ‘Add New’. Download from the Discordian Date page in the WordPress Plugin Directory. Donations to provide incentive for further development or simply appreciation for the current plugin are always welcome and greatly appreciated. I took some time to actually do a little bit of work on this plugin tonight. I changed the background image a bit, and got rid of the display of the current time. The plugin now gets the date from the time zone as set on the server. This can be altered via .htaccess or php.ini files if desired. Tomorrow, if I get around to it, I’d like to get this thing uploaded to the official WordPress plugins repository. Other than putting more details into the readme.txt file, I think it’s ready to go. 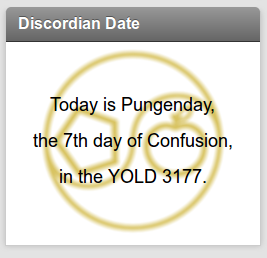 I’ve begun working on a plugin for WordPress that will provide a widget to display the date according to the Discordian Calendar. I do this for no other reason than the fact that one didn’t yet exist, as far as I have seen. I would like to provide means for a person to use this plugin and choose their own time zone, set their preferred output style, etc. It’s nothing more than a toy, or a diversion, for me, but at least I can have fun with it. I’m learning: always. I’ve been looking for something like this for quite some time. So, thank you. 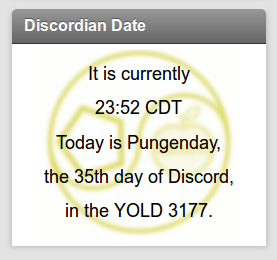 I already had the code to display the current discordian date though. Is there going to be a way to integrate into ? I would love to have my blog set up to display something like: Posted on Pungenday,the 9th day of Bureaucracy, in the YOLD 317. Also, I love how the largest tag on your website is fuckwits. ok. code posting isn’t working, of course. that sentence should have been Is there going to be a way to integrate into php the_date ? Thanks, Gene! Using the Discordian Date in place of the regular date function in posts, replies, etc. shouldn’t be that difficult. I know that there are options for using other calendar systems, like Hebrew Date. I should take a look at that one to see what I might be able to come up with. Ah, so question. What’s the license on this? GPL2?